The Oxford Dictionary defines texture as ‘the way a surface, substance or piece of cloth feels when you touch it, for example how rough, smooth, hard or soft it is’. As photographers we constantly strive to capture what we see in our pictures. Shooting textures takes the challenge one step further: conveying to the viewer not only how something looks, but also how it feels to the touch. A great texture shot reaches out and grabs you. Bricks are everywhere in town and country alike, from smooth and flat to misshapen and crumbling, they form the boundaries of our daily lives. 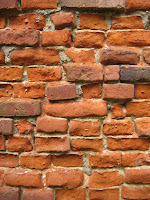 Bricks often have the added bonus of creating patterns and symmetrical shapes. You can try photographing them en masse or up close for a different perspective. There are plenty of great textural opportunities in nature. Tree bark may be glossily smooth or dry, peeling and rough. Leaves can be veined, spiky, succulent. Take a hike in the countryside, a walk in the park or a simple stroll along your street and you are sure to come across an interesting specimen or two which grabs the eye of your camera. Again, it’s hard to go far without coming across a painted surface, inside or out. Used to protect, prettify and portray, it sadly doesn’t last forever, but this creates some good opportunities for the budding texture photographer. A shiny new coat of paint on a windowsill, an old peeling fence or a thickly layered oil painting all invite the lens forward to reproduce their touchable qualities. Cold, hard, smooth, chipped: stone lends itself well to the study of texture, both in nature and in more urban settings. A pebbly beach may not seem as tempting a prospect as its sandy counterpart, but the range of shapes and sizes of the stones underfoot can’t help but fascinate the interested observer. The glossy marble interior of an expensive hotel or the skilfully crafted contours of an architectural masterpiece remind us that stone can also be one of the ‘biggest’ textures we might choose to photograph. So recognisable to us thanks to its many uses in life, wood is another classic textural subject. Every stage from forest to finished product presents a new opportunity: twisted roots, roughly chopped fire piles, shavings and splinters in the carpenter’s yard, smoothly sanded new grain, visible gnarls and knots, a slickly varnished chair leg – there’s never an uninspired photographer around wood! Smooth, cool and reflective, rusty, tarnished and dull, metal easily gives up its age and provides the photographer with another great texture to work on. Check around your home and discover the many pieces of metal which hold together our households. Hop outside to the garden to capture the effects of the weather on this omnipresent material. A huge part of our daily lives, fabrics and furnishing materials can be some of the most enjoyable textures to touch, but are sometimes the most difficult to capture. Wonderfully soft velvet, itchy but warm wool, a deep shag pile carpet, rough sisal matting, smooth silk, fresh crisp cotton – the opportunities are endless, just take a quick look at what you’re wearing today and the furnishings around you. Perhaps a less commonly-seen subject for many, rope has plenty of scope in the texture department. Rough and fraying or smoothly waxed, the many different sizes of rope offer the photographer the chance to move in close and grab that macro texture shot. If you can get to a fishing port you will surely see some great rope action. These are just a few ideas - it would be great to hear suggestions for other interesting textural subjects! This post was also published on the Digital Photography School website.